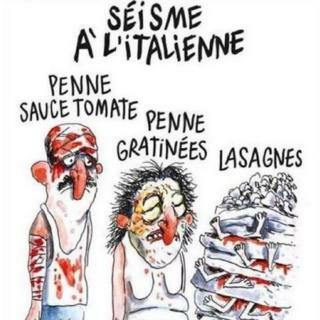 Satirical French magazine Charlie Hebdo has been criticised on social media for a cartoon depicting Italian earthquake victims as pasta dishes. The cartoon which features in its current issue refers to the town of Amatrice, one of the areas hardest hit by the 6.2 magnitude earthquake last week. Amatrice is home of spaghetti all'amatriciana, a dish with ingredients including tomato sauce, and guanciale ham. The image shows an injured man and a woman standing next to a pile of rubble from which feet can be seen. Each of the standing figures has been named after a pasta dish. The bandaged man is shown under the words penne tomato sauce, a woman with burns is depicted as penne gratin, and bodies lying beneath layers of rubble as lasagne all beneath the heading "Earthquake Italian style". The cartoon which is being circulated on social media has attracted huge criticism globally and in Italy it has made the pages of Italian national newspapers La Stampa and Corriere della Serra. It is not the first time #CharlieHebdo has been used on social media to express outrage at one of its cartoons. @DaniBailo tweeted in Italian: "The cartoon you didn't expect. Worthy is the concept that satire is free but good taste has boundaries." While @Lellina23 posted: "This is disgusting. #CharlieHebdo you need to learn a little respect! #Italyearthquake #Italy"
In another post @RNocerino goes into detail criticising the cartoon. In it he states: "All I would like to say is if Charlie Hebdo was bombed again I shall not be participating in the status Je Suis Charlie." The magazine is no stranger to criticism. In 2015 it published a controversial cartoon of the young Syrian refugee Alan Kurdi who drowned while fleeing Syria and has also posted controversial sketches of the Prophet Muhammad. Despite the current controversy the publication has also been seen as a beacon for free speech, with many of its defenders using the hashtag #JeSuisCharlie to defend the publication and its articles particularly following the attack on its offices in 2015.